Computers are getting smaller faster. 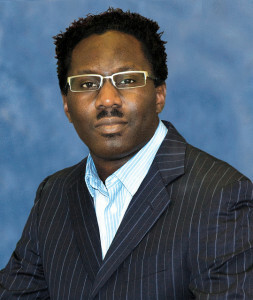 Deji Akinwande, an engineer at UT Austin’s Cockrell School of Engineering, discusses Moore’s law and some groundbreaking technology advances. Akinwande has been honored with the inaugural IEEE Nano Geim and Novoselov Graphene Prize, the IEEE Early Career Award in Nanotechnology, the NSF CAREER award, the Army and DTRA Young Investigator awards and the 3M Non-tenured Faculty Award. He is a past recipient of fellowships from the Ford Foundation, Alfred P. Sloan Foundation and Stanford DARE Initiative. He recently co-authored a textbook on carbon nanotubes and graphene device physics by Cambridge University Press, 2011. His recent results on silicene have been featured online by Nature and Time magazine, among other media outlets. His work on flexible 2D electronics was selected as among the “Best of 2012” by the Nanotechweb news portal and has been featured on MIT’s Technology Review and other technical media outlets. In April 2015, Moore’s law celebrated 50 years of achievement. Moore’s law is in essence an observation by Gordon Moore that the number of transistors – the tiny off and on switches — in a semiconductor chip was doubling approximately every two years. This has been enabled by the biennial reduction of the dimensions of silicon that is used to make electronic chips, a very successful practice for many decades, and has resulted in semiconductor chips that are very small, very powerful and yet economical, ushering in the current era of mobile technologies. Over the past several years, the practice of reducing the thickness of silicon to enable ever more advanced chips has become challenging because the silicon thickness is now approaching atomic dimensions. With our collaborators, we recently discovered a method to overcome the challenge of making very thin silicon, by developing a bottoms-up approach to grow the silicon rather than the traditional thinning process. This one atom thick silicon is named silicene. Until a few years ago, man-made silicene was a theoretical material. One of the major challenges to creating silicene is the material’s complexity and instability when exposed to air. We were able to fabricate silicene through a layering method that reduces its exposure to air. By demonstrating the first silicene transistors, we proved this material could lead to more energy efficient electronic chips in the future. Additionally, theoretical physics suggests that silicene is suitable for quantum computing. While silicene is still in its early stages, it holds promise for computing and the continuation of Moore’s Law into the foreseeable future.